It looks like it is going to be a busy spring! Fortunately the very successful Gourmet Breakfast was well supported by the club, friends of the club and the patrons and will help fund our several local and international service projects. 4) leading the very successful Morrisville HS Leadership Academy and seeing that four of the students get to participate in Camp Neidig, the District's annual youth leadership training weekend. 5) supporting the May 11 fundraiser of the Reach Out Foundation of Bucks County by each member sending a solicitation letter to one or more local business owners or profession persons. (That was Easy!) Members, their families and friends can also support the effort by attending the May 11 event. And thanks to Michele for making the email distributions. Of course our next all important fundraiser, the Spring Carnival May 4-8, will determine just how much we can help the YMCA, the Snipes Education program, Reach Out and other local organizations at the end of this Rotary year. So please mark your calendar and be ready to help in the Carnival ticket booth when asked by Ted or Dave. The generosity of the club is very impressive. 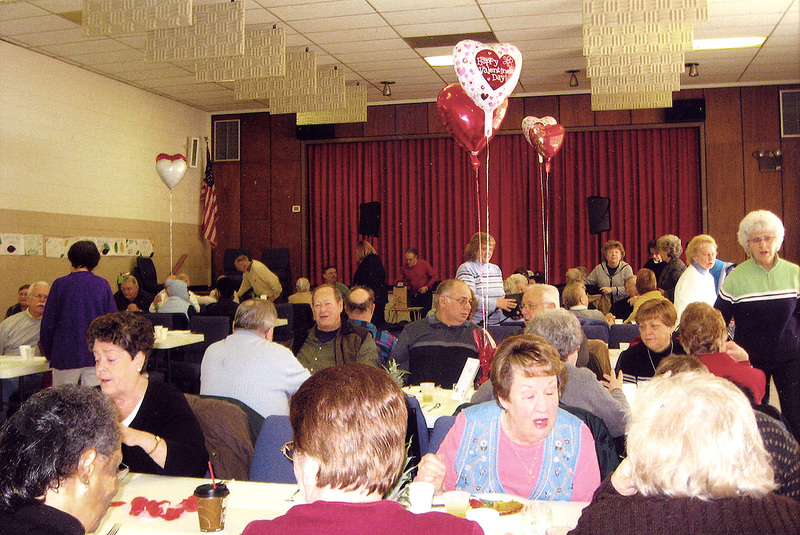 For example, "Service Above Self" was made real over the Christmas holidays when we suspended our annual Christmas party in lieu of donating to the Bucks County Courier Times Give-A-Christmas Fund, to the tune of $438. 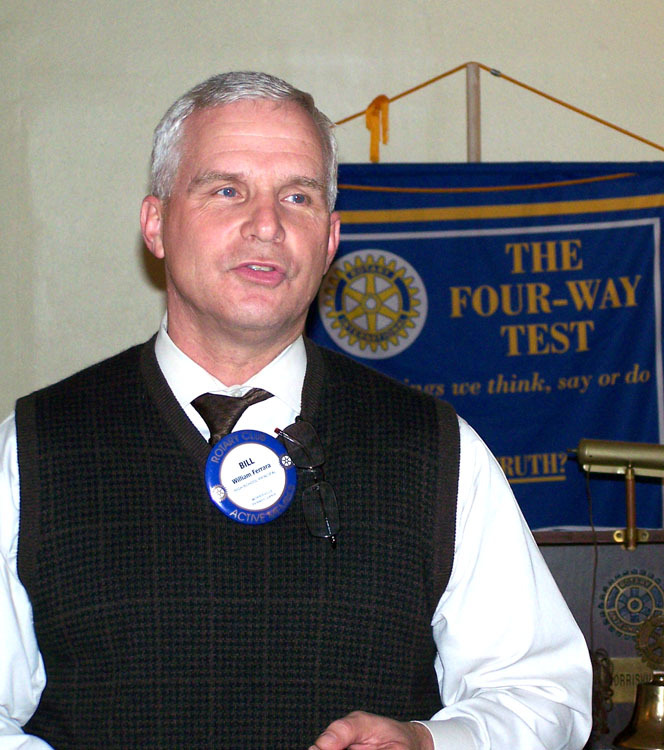 Our members continue to support the Rotary Foundation through the $2 weekly meeting donation, Piggy Bank savings and Paul Harris contributions. We likely will have 100% Every Member Every Year (donations of any amount), a good percentage of Sustaining Members ($100 or more per year) and several Paul Harris Fellow contributions ($1000 each). As a result, our commitments to Polio Plus and the Peru Walter Filter Project will be met and the club will continue to support Rotaplast and Lee's involvement in the program. In addition there will have been a number of individual contributions to Rotaplast and ShelterBox. April 2 (just around the corner) District Assembly - a great opportunity to see what is going on around the District. April 29- May 1 District Conference - an even greater opportunity to feel like you are a part of something much bigger than just our local club. Also great fun, food and fellowship! May 21-25 Rotary International Conference in New Orleans. Bill Gates to give the keynote address. June 30 Reserve this date for the terrific Passing of the Gavel that Denny is planning! Note that we have several new member prospects and our weekly programs continue to be interesting and informative. RNRNR (That's Rock 'n Roll in Rotary! In a world of bravado and compromise, the Word of God is an oasis of sanity and joy. 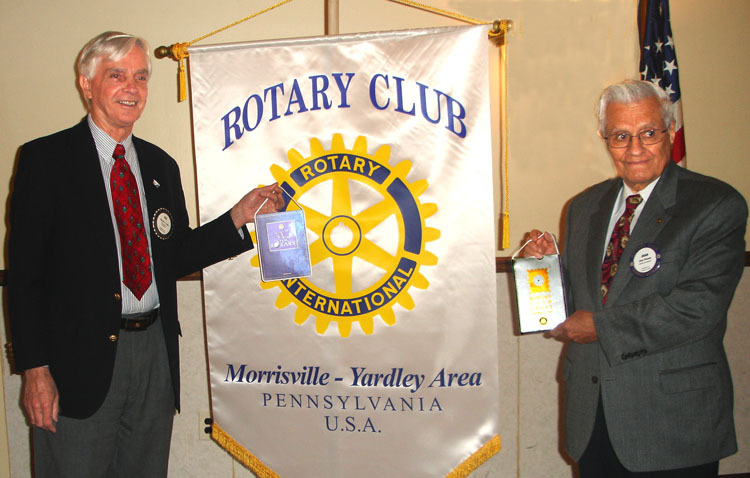 Rotarian Bill Ferrara, Superintendent of the Morrisville Schools, gave an update of the innovative High School Leadership Academy and Manny Abalo gave his Classification speech (see previous Rotaryite). Manny grew up in Liberia, West Africa. As a young broadcaster during the political turmoil in Liberia he came under serious political pressure. 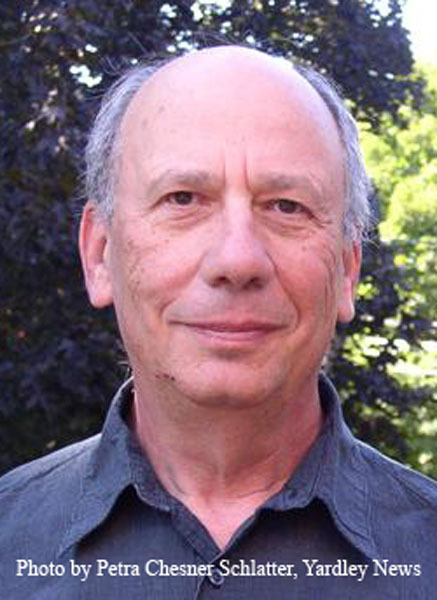 He managed to get out of the country and subsequently emigrated to the USA. He and his wife, Aneza, also from Liberia, became members of the club in 2010. Shelly Franklin was formally inducted into the club. 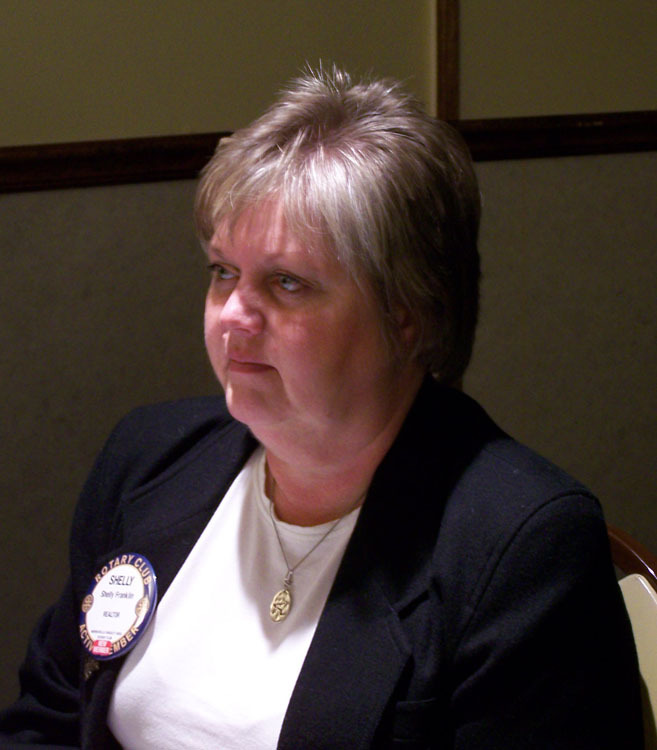 She is an Iowan who settled with her family in Morrisville and is a realtor with Long and Foster in Yardley. Shelly already has been involved in a number of club projects says she loves fundraising! Yes! 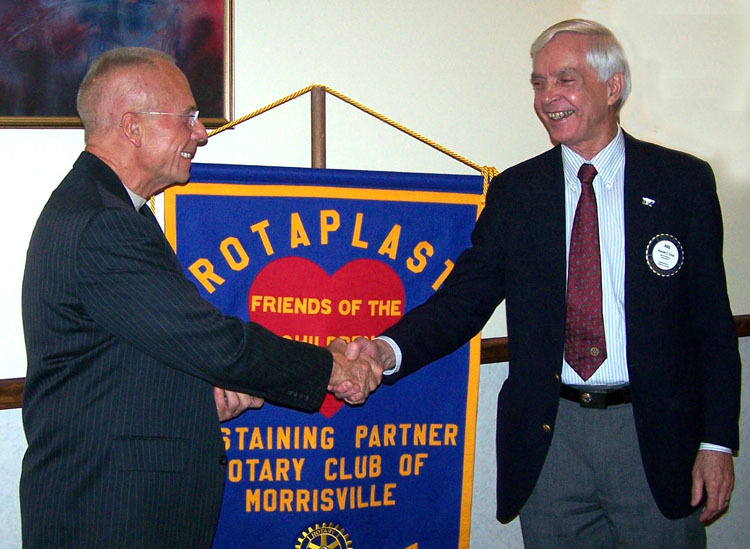 The club's own Rotarian, Lee Nolting, spoke of his work with Rotaplast over the last few years which has included travels to Venezuela and Colombia. He noted that our District is committed to a Rotaplast mission every 2 years and the club has been supporting the effort for several years. Election of Officers and Board members was conducted (click on side menu for Officers and Directors). serious illnesses, especially among children. 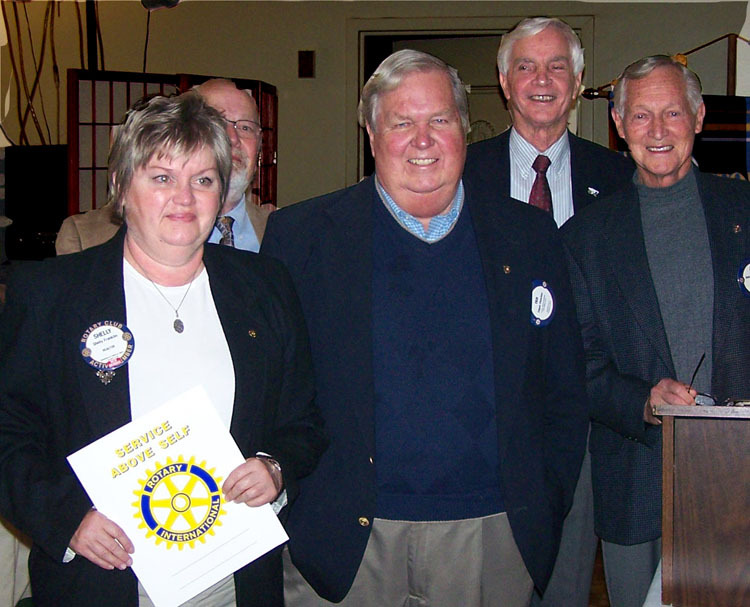 The club's Rotary Foundation Chairman, Tom Miller (left), himself a "Multiple Paul Harris Fellow", presented "Multiple Paul Harris Fellow" awards to Dave Sample and Hal Long (right).The Paul Harris Fellow award is in recognition of a $1000 donation to The Rotary Foundation. The "Multiple" recognizes that more than one Paul Harris donation has been made. 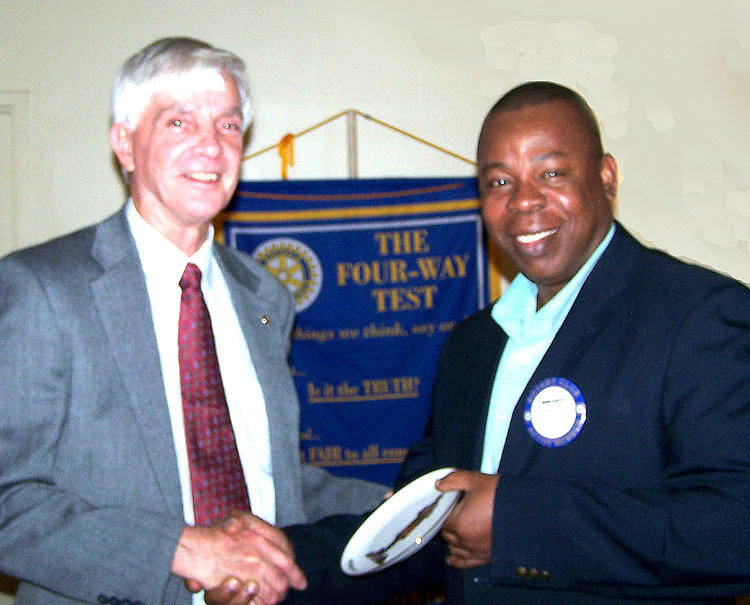 The Rotary Foundation funds humanitarian projects world-wide. The largest is the almost $1 billion PolioPlus project that is very close to eradicating polio from the face of the earth. Others include peace fellowships to encourage cooperation among people in all nations and thousands of projects to provide clean water and improve the health, economic and educational conditions of people throughout the world. 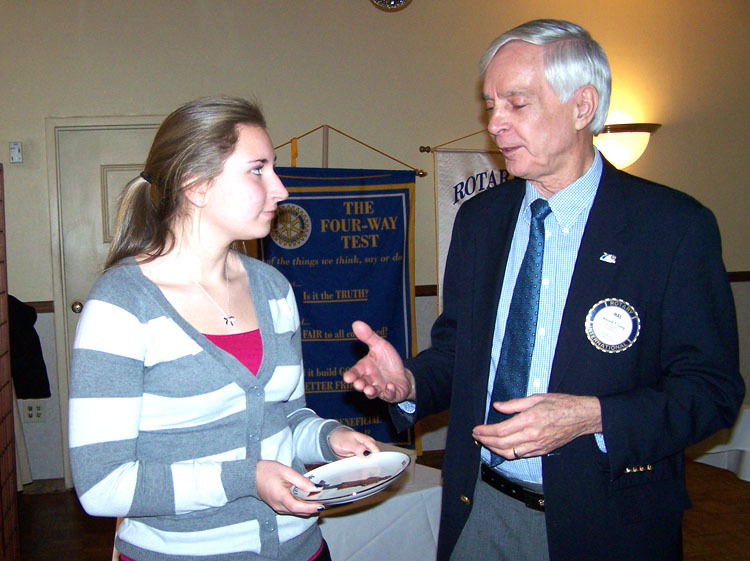 Katie Leather,a Morrisville High School senior, talked about her experience at Camp Neidig last year. She said she went kicking and screaming but returned totally excited about her experience, what she learned about leadership and the lasting friendships she made. Our District (7430) hosts Camp Neidig, generically known as a Rotary Youth Leadership Development Camp. It is called "Camp Neidig" in memory of the Rotarian in our district who founded it many years ago. It is a 4-day adventure in the camp site in Amityville, Berks County, PA, for some 60 or more selected high school juniors. Katie said that she was trying to get out of going up to the last minute but after the experience she would go in a heartbeat if given another opportunity. "The goal," she said, "was developing self confidence, communication and team work". The time was spent discovering how to build teamwork and developing leadership capabilities through interactions with adult professionals and through physically and mentally challenging problem solving activities. Through this Katie said she made some lasting friendships of people who were total strangers when they first came to camp. Some she said she is in contact with daily. Marie of Michaels' Restaurant, gave a very inspiring talk on Italian Night about immigrating to the U.S., meeting Michael, her husband, going into the restaurant business, and raising a family. She emphasized the importance of family and maintaining traditions. 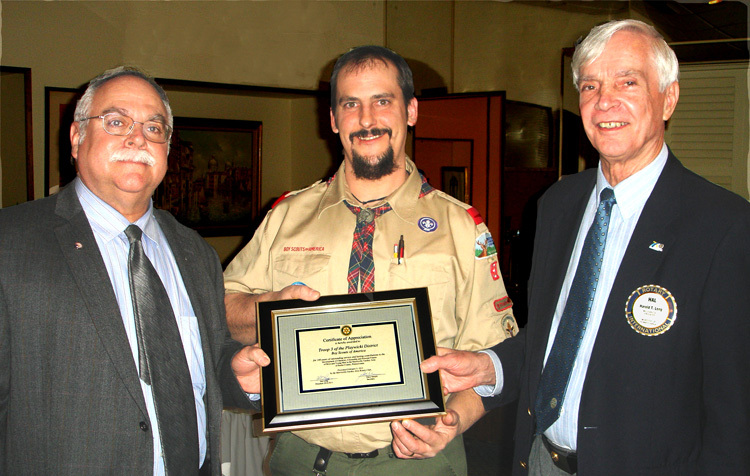 The club honored the area Boy Scout leaders for their service at its annual appreciation dinner. This year was special in that it is the 100thYear Anniversary for Troop 3 and the club made a special presentation to Scoutmaster Mike Bajor and Bill Burgess (left), who is the representative of the sponsoring Morrisville Presbyterian Church. Club President Hal Long made the presentation on behalf of the club. 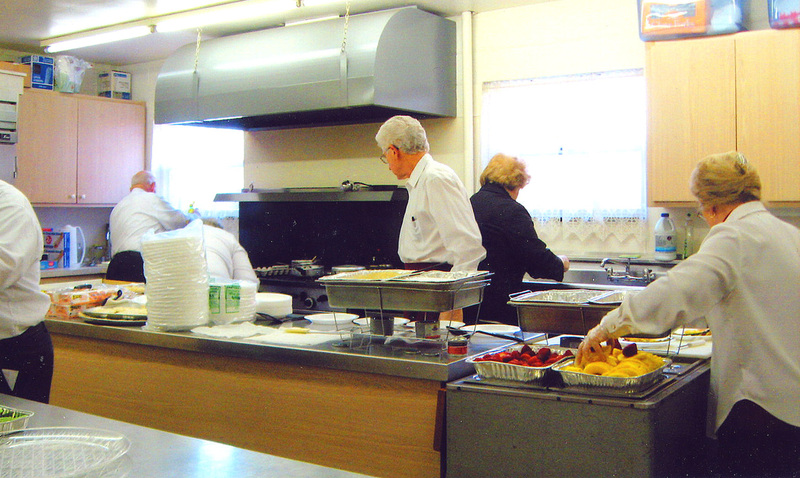 The recent Gourmet Breakfast at the Morrisville United Methodist Church was well supported and will help the club support its several local and international service projects. 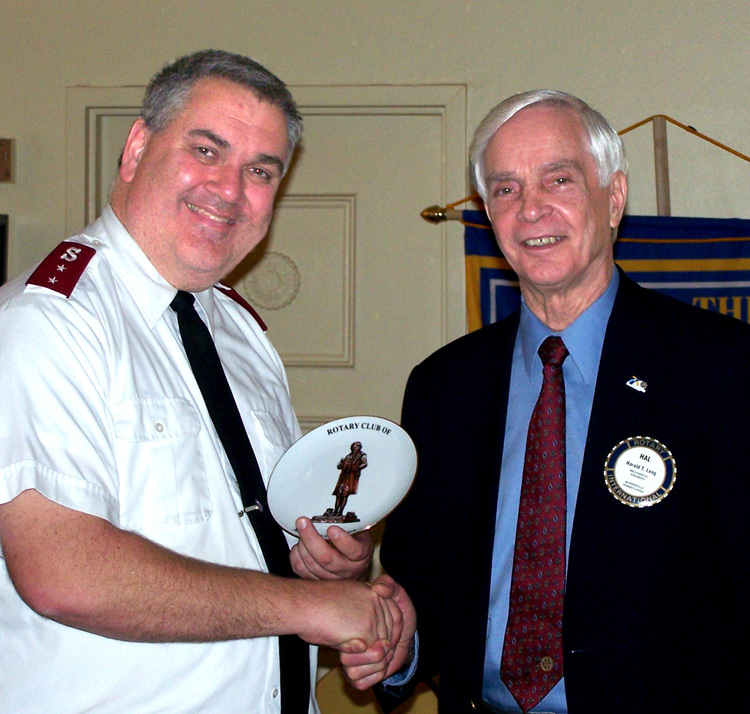 Captain Jud Laidlaw of the Salvation Army in Levittown and a Rotarian himself, talked to the club about service and praised the work of Rotarians in the community and worldwide. He spoke about the many wonderful programs the faith-based organization conducts, including a back-pack and school supply project for the needy and at-risk kids. The Salvation Army also maintains a crisis intervention program for the most vulnerable in the community. Denise Berstein, a registered nurse who now has her own business, gave a very interesting presentation about In Home Assisted Living as an alternative to Nursing Homes and other facilities. She became interested when she had to deal with support for her own mother in her mother's home and found many of the support services less than satisfactory. She can be reached at 267-568-2638 ("Right At Home") for more information. 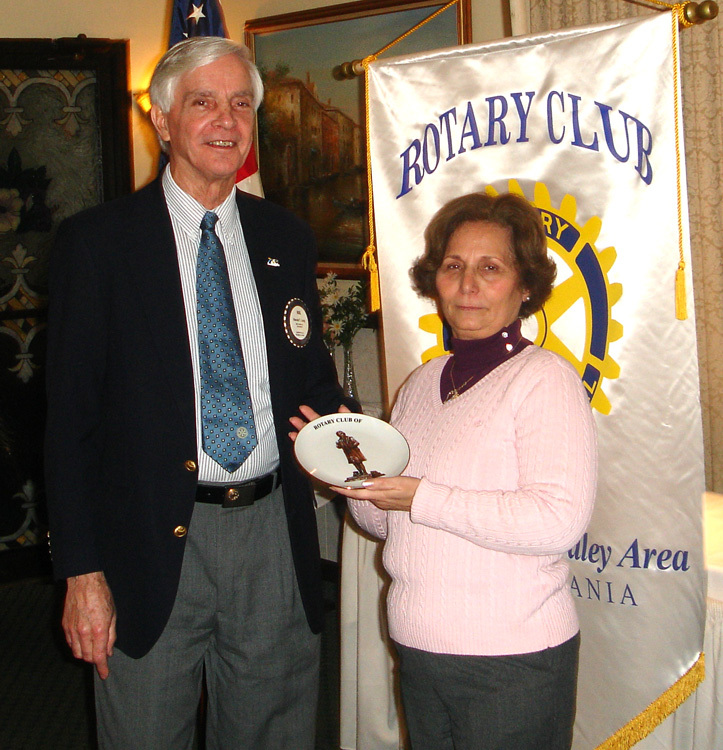 The Morrisville-Yardley Area Rotarians and their dinner guests joined to honor two very special people. Lu Jennett was made a Paul Harris Fellow in recognition of her long and faithful support of her husband, club member Elias ("Big E"), her service for many years as a caring nurse and her service to her church and friends in the community. 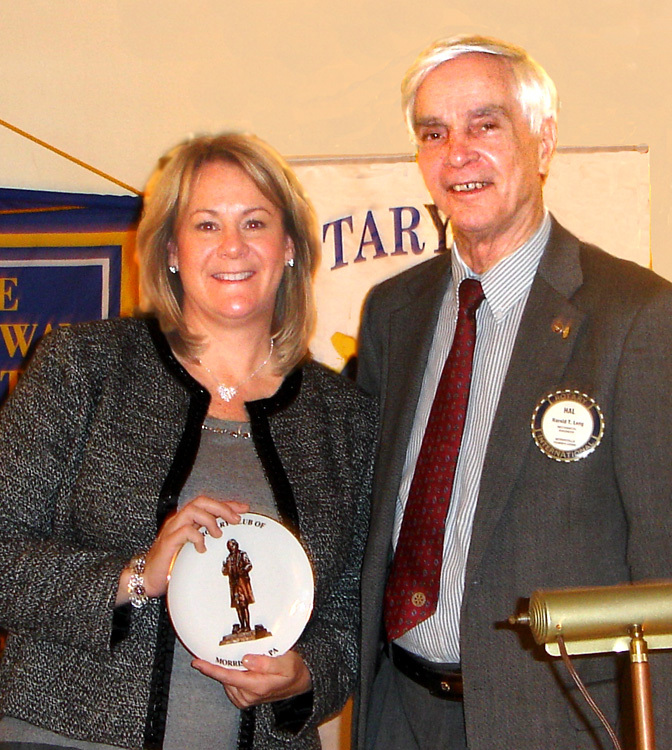 Club member Bill Grassel was honored as a Paul Harris Fellow for his military service as a Marine (serving in combat in Korea), his dedication as a university professor to his students for many years and his support of Rotary. 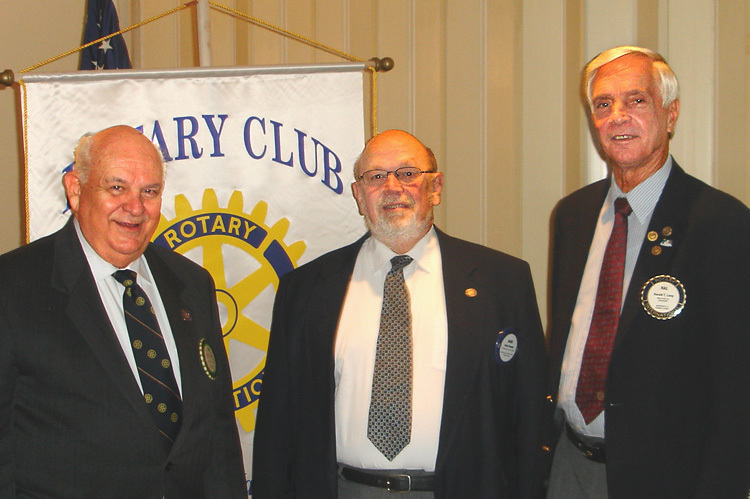 The presentations were made by club members Andy Thompson and Tom Miller (left) and President Hal Long (right). Bill Grassel, Lu Jennett and Elias are center. 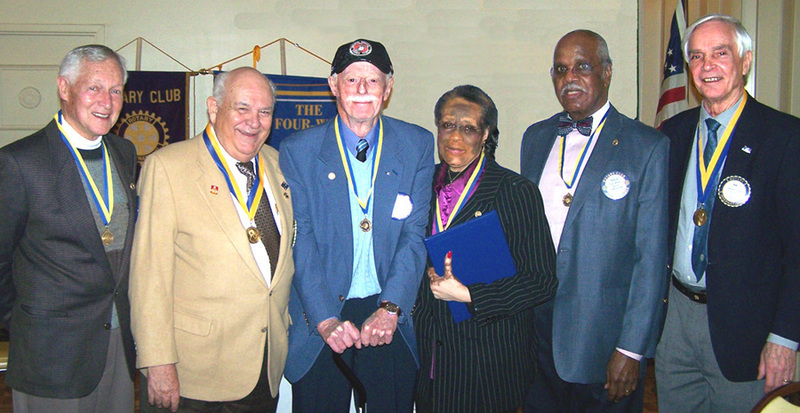 The Paul Harris Fellow award is authorized by the Rotary Foundation for those who have displayed notable service through Rotary and to others and each award is backed by a donation of $1000 to the foundation. The speakers of the evening were Major Phil Davis, director of the Salvation Army in Trenton, NJ, and Roy, a successful graduate of the Salvation Army's Addiction and Rehabilitation program and now a worker in the program. They spoke about the scourge of substance abuse and the vital importance of being vigilant and attentive to young people who may be at risk. Roy spoke about his own journey growing up in a seemingly normal environment but never quite feeling that he "fit in". Major Davis presented a Power Point program about "Neutralizing Addiction" and emphasized the important role grandparents and others need to play in observing and nurturing young people. President Hal presented a Robert Morris commemorative plate to Roy and encouraged him to continue his work of counseling young, vulnerable people in the society. Sinberg, Mayor of Yardley, talked about the borough's preparations for the anticipated flooding and what the borough and its residents have been doing the past few years to deal with the floods.